An entropion is an inward turning of your eyelid and lashes that is usually caused by the gradual weakening of the muscles and tendons in the eyelid due to the natural aging process. Normally an entropion occurs with the lower lid, although it can occur with both the upper or lower lids. If you have an entropion, it is often very uncomfortable, because your lid and lashes will be constantly rubbing on and irritating your cornea. 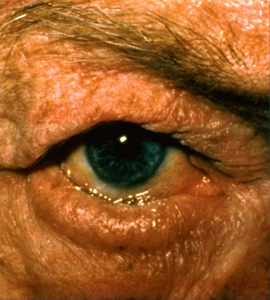 Although entropion is most commonly associated with aging, it can also be caused by an acute spastic response to infection, inflammation or ocular trauma. Other symptoms associated with an entropion are discomfort, excessive tearing, redness in the eyelid, eye irritation, the sensation of having something in your eye and sensitivity to light. The irritation to the cornea caused by the entropion can lead to vision-threatening complications such as infection and corneal ulcers. Therefore, you should not ignore this disorder. If the irritation, redness and discomfort suddenly becomes much worse, you should immediately contact your eye doctor, as this can be the sign of an ocular emergency. How Is an Entropion Detected? An entropion is detected during a comprehensive physical or eye exam. If your primary care doctor sees an entropion during your physical, he may refer you to an eye doctor or ophthalmologist for treatment. Using a slit lamp examination, your eye doctor will examine your eyelids, lashes, and eyes. The treatment of your entropion will depend on the severity of symptoms. In mild cases, your symptoms may be controlled using the standard treatment for dry eye syndrome, including lubricating eye drops and ointments. If you entropion is caused by a spastic response, the therapeutic injection of small amounts of botulinum toxin, Botox®, can be effective. This injection weakens the underlying muscle that causes the spasm. The injection can also be repeated if necessary. A temporary solution, particularly if your entropion is caused by spasm, or if you are unable to have a more permanent surgical procedure, is a minor procedure called Quickert suturing. Two or three heavy sutures placed in precise locations are used to turn the eyelid out. This procedure, which requires no incision, is done under local anesthesia in the office. While this can provide effective, short-term relief, the procedure does have a high failure rate and usually does not provide a permanent solution for entropion. Therefore, surgical treatment is frequently required for more severe inversion to prevent potential vision loss. If your entropion is related to the natural aging process, the surgery may involve removing and / or tightening the supporting muscles and tendons for your eyelid to remain in a normal position. After diagnosing an entropion, our board certified ophthalmologist who has completed an advanced fellowship in oculoplastic surgery, will review the appropriate treatment options with you. He is a specialist in providing therapeutic injection, minor procedures such as Quickert suturing and surgical treatment for an entropion. During these procedures, you will feel little or no discomfort. On the day of treatment, you will be welcomed by a staff member. If you are having a therapeutic injection of Botox® or Quickert suturing, you will remain in your street clothes. Topical and / or local anesthesia will be used, and you will remain comfortable during the treatment. If you are having a surgical procedure, the staff will help you prepare for your surgery by putting eye drops in your eye. You will be given a gown to wear over your street clothes during your actual surgery. You may be given a relaxing sedative along with local anesthetic. An injection will also be given around the eye to prevent movement. The procedure normally takes about 30-40 minutes. In most cases, about a dozen tiny stitches will be used to close the incision, which will remain in place for up to two weeks and will self-dissolve. Typically, no eye patching is necessary. Your eye may appear to be bruised and swollen following the surgery. However, this should not cause significant discomfort and will subside in a few days. Your surgeon will check your eye the morning after surgery to monitor healing and check for signs of inflammation and infection. Some potential complications from entropion surgery include the risk of bleeding, infection and hematoma, which can usually be successfully treated. The benefit of preventing the potentially vision-threatening consequences of untreated entropion would normally outweigh these risks.